Woodburning stoves were workhorses of the heating world. Antique potbelly stoves were the workhorse of the heating world. They multi-tasked, did their job well and were built to last a long time. Many are still in operation today. A potbelly is easily identified by its unique shape. It is barrel-shaped, with a pronounced bulge in the center of the barrel. Made all of cast iron, it burns wood and gives off significant radiant heat. The stove comes in small, medium and large sizes. A small stove can comfortably heat an office; a large one can warm a large meeting hall all night long. The stove stands on feet or an iron platform. A stovepipe vents smoke out a ceiling or a wall. A hinged door accesses the firebox and allows for wood placement and cleaning. Draft controls allow for adjustment of air flow. Due to their popularity, there were a variety of makers, models and features. One feature was a cooking area on top. This was a good choice for schools, as teachers would cook lunch for students on the cook top. Another variation was a ring around the largest part of the barrel. This was a safety feature to prevent burns if someone bumped into it. Some ornate versions had nickel-plated decoration. Some models had two doors, one for adding wood, one for removing the ashes. 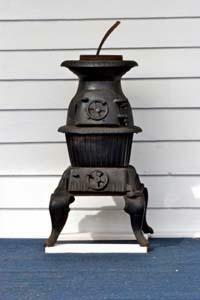 The antique potbelly stove was used worldwide and in every type of structure. The potbelly was developed in the mid-19th century as an improvement on some of the older cast iron designs, such as the Franklin stove. It became an icon of Americana, portrayed in illustrations, photographs and movies.While it was heavy, weighing several hundred pounds, it was still relatively mobile. Unlike a fireplace, which usually required a masonry chimney, the potbelly's stovepipe could be disassembled and moved. Being this transportable, it was easy to ship from catalog stores and easy to transport to the Great American West. Like the horse after the invention of the automobile, the potbelly faded into the background at the advent of furnaces and central heating in the mid-20th century. Many were placed in barns and basements to rust away. Others however, were cared for and restored. As an excellent heating source, the potbelly is used now in cabins and even homes. As a historical icon, it is popular in restaurants and hotels. Currently, potbelly reproductions are made by numerous manufacturers. The most important factor is to determine the condition of the firebox, the grate and the stovepipe. Look for cracks, warping or gaps; do not put a fire in the stove if these appear unsound. A professional stove restorer can evaluate the potbelly for safety and possible repair. Since the potbelly is made of cast iron, it is subject to rusting. Keep it away from water if possible. If there is minor rust, use either a steel wool pad or a drill mounted wire brush for removing the rust. If the color needs a touch up, use black stove polish or paste found at a local hardware store. Rub the polish on and light a fire in it to cure the polish. If the stove will not hold a fire, enamel paint will also work. Do not use enamel paint on one that can hold a fire, as once a fire is lighted, the enamel paint will peel and smell. Cleaning nickel pieces can be difficult. It is best to contact a stove restorer for cleaning or replacing the plating. Many restorers also offer replacement pieces, as well. Antique stoves are very popular and very collectable. They are so popular that whole websites are devoted to the antique stove community. Like all antiques, the potbelly should be in good, original condition to be the most valuable. While the exterior condition is important, some rust is to be expected and will not detract significantly from the value. More important is that there are no cracks and no missing pieces. The potbelly invites conversation and fellowship. It's a charming way to add character, as well as warmth, to any room.